This month's theme was SOMETHING WICKED THIS WAY COMES! Here's all the stuff I got in my box this month. 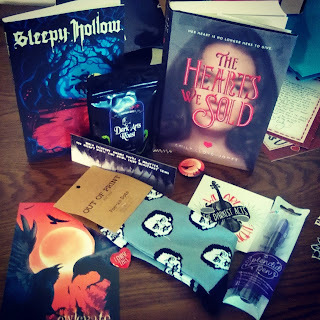 If you want to sign up for OwlCrate, their website is here. The Hearts We Sold by Emily Lloyd-Jones. Dee makes a deal with a demon; her heart in exchange for an escape from her awful home life. But she soon gets more than she bargained for, and she's thrown into chaos with other "heartless" teens. Sleepy Hollow & Other Stories by Washington Irving. A short story collection, including one of the most famous horror stories of all time, featuring the Headless Horseman. A lapel pin, inspired by The Hearts We Sold. Socks with Edgar Allan Poe on them. Um... YES. Coffee, specifically, the Dark Arts Roast. I don't drink coffee, but I'm sure someone in this house will appreciate it. A sticker inspired by This Savage Song by Victoria Schwab (which has been on my TBR forever). There's also a preview for next month's theme: MYTHICAL CREATURES. Can't wait!